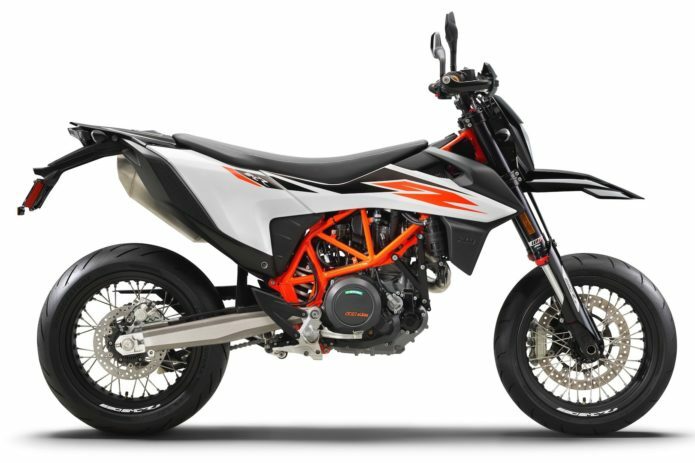 It has been a while since KTM offered a supermoto motorcycle, so we are pleased to see the 2019 KTM 690 SMC R to go along with the all-new KTM 690 Enduro R dual-sport motorcycle. Let’s take a look at what KTM’s supermoto entry has to offer. 1. This is a new LC4 motor. Retaining the SOHC architecture, the four-valve LC4 powerplant has the latest ride-by-wire technology, along with dual balancer shafts for a smoother ride. The dual-spark head has separate timing for each spark plug. The stainless-steel exhaust houses a catalytic converter.